Gordon Giltrap was appointed a Member of the Order of the British Empire (MBE) in the 2019 New Year Honours, "for services to music and to charity". Exclusively available from the publisher, Wymer Publishing. Over the past forty years, Gordon Giltrap has graced the music business with his dedication to his craft and his affection for his audience. As one of the UK's most respected guitarists, he has consistently proved the adage that respect cannot be bought. It must be earned. Gordon joined his first band when barely in his teens, and relished the opportunity to play songs by his idols - Cliff Richard, The Shadows and The Everly Brothers. He set his sights on Art College, but bowed to his father's insistence that he learn "a trade", and grafted his way through a series of unrewarding jobs. 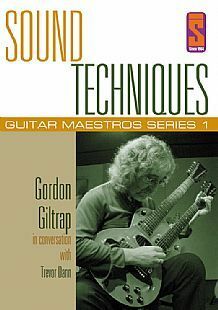 Gordon unwittingly taught himself a hybrid technique of plectrum and little finger, but in doing so, created the individual sound that is still his trademark. He continued to play the guitar in his spare time, and in November 1966, he singlehandedly secured a recording contract with Transatlantic Records. In the late Seventies, Gordon enjoyed a brief spell as a pop star, with a hit album Perilous Journey and two hit singles 'Heartsong' and 'Fear of the Dark'. 'Heartsong' was nominated for an Ivor Novello award, and is fondly remembered as the theme tune to the BBC's Holiday programme. 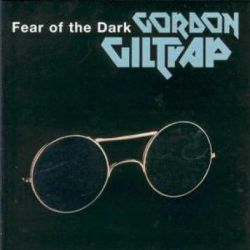 Fear of the Dark was the first 12-inch colour picture disc to be released in the UK, and featured a heavily-made-up and unflattering image of what was then being marketed as The Gordon Giltrap Band. It was during the photo session for the picture disc that each of the band members were advised to wear make-up otherwise their features would not be seen on the finished product. Low and behold when the disc was released it was patently obvious that they were wearing make-up. Needless to say they were not best pleased! During the early eighties circumstances, many beyond Gordon’s control dictated that he would eventually retreat gracefully from the rock spotlight and return to his first love of solo acoustic guitar. 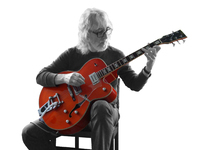 Over the years, Gordon has worked with an amazingly broad range of artists, from rock musicians such as Brian May, Rick Wakeman and Midge Ure to the jazz virtuoso Martin Taylor, the classical guitarist Raymond Burley and the London Symphony Orchestra. In 1996, Gordon realised a dream of playing guitar alongside Cliff Richard, on stage in Cliff's West End musical Heathcliff. As well as performing in the role of The Troubadour, Gordon arranged the overture and wrote two pieces of music. In 2000 Gordon felt very honoured to be invited to become a member of The Grand Order of Water Rats...The GOWR is the oldest show business charity in the UK and has among its members Rick Wakeman, Brian May, John Lodge (Moody Blues), Joe Brown, Bert Weedon, Jim Marshall and recently Nico McBrain the drummer with Iron Maiden. Past Water Rats include Charlie Chaplin, Sir John Mills, Tommy Cooper and many more. His first performance DVD - Live At Huntingdon Hall - was released in 2003, and reveals the ample skill and charm of one of this country's national treasures. In 2005, Gordon staged a special concert at Birmingham Symphony Hall, performing his own compositions as a solo artist, with guest musicians from contrasting disciplines, and with the Sheffield Philharmonic Orchestra. Gordon was also part of the Guitar Maestros series of DVD’s that featured many legends of the instrument such as Martin Carthy, Martin Simpson, Big Jim Sullivan, Clive Carroll, John Etheridge and Wizz Jones. These superbly produced DVD’s feature exclusive interviews with that legendary writer and presenter Trevor Dann. In 2008 Gordon received a Life Time Achievement award from the Newtonards Guitar Festival in Northern Island. Gordon regards this as his most treasured possession coming as it does from the land of his grandfather’s birth and a country with a musical tradition close to his heart. Indeed Ireland has taken him to their heart. Gordon's music continues to evade categorisation and is nigh on impossible to put into any kind of a niche influenced as it is by the rock guitar of Hank Marvin and Pete Townshend, the folk guitar of Bert Jansch and John Renbourn, and the classical guitar of Julian Bream and John Williams. He has released 25 original studio albums, plus numerous live albums and compilations. The past few years have seen Mr Giltrap embracing technology in the form of a Boss Loop station, enabling him to record whole sections of music, playing it back and then adding layer upon layer to create a huge sound canvas climaxing in soaring electric guitar! This part of his show has become somewhat of a show stopper and has to be seen to be believed! In 2009 he was approached by the major musical instrument company JHS to produce a Gordon Giltrap signature guitar. Once again Gordon rose to the challenge. The end result being the VINTAGE VE 2000 GG signature guitar. The guitar achieved rave reviews and was voted ACOUSTIC GUITAR OF THE YEAR by the Music Industry Association. This has resulted in the company producing the Gordon Giltrap guitar range with five guitars in all! People like Midge Ure, Brian May and Nik Kershaw can be seen on stage playing the instrument that bears Gordon’s name. Gordon continues to embrace new projects, one of note being the 2009 'From Brush and Stone' album with his good friend Rick Wakeman. This led on to working with Oliver Wakeman, Rick’s gifted son to produce the 2013 critically acclaimed ” Ravens and Lullabies” album. This album pulled Gordon out of his comfort zone, and encouraged him to pick up his electric guitar once more, thus placing him firmly back in the Progressive Rock Arena where he found international fame in the mid to late seventies. This is the first album of its kind that Gordon has ever been involved in with its song based content from the pen of Oliver Wakeman, and true collaborative material from both men. Gordon is justifiably proud of this album and his association with this young prince of the keyboards. In 2018 Gordon created the album HEARTSONGS as a fundraising tool for The Queen Elizabeth Hospital in Birmingham as a way of saying THANKYOU for all the care he received through two lots of major surgery. The album in its original form was released several years prior under its initial title of SHINING MORN. 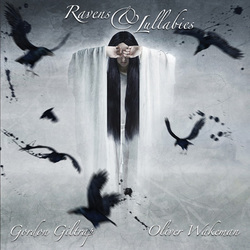 The rights to this album reverted back to Gordon but instead of re-releasing it he decided to re package the album and replace some tracks with newer pieces. The result in Gordon's opinion was that in many ways it was superior to the original release with more eye catching artwork. Paul Ward his friend and collaborator on their album THE LAST OF ENGLAND remastered the album thus rounding off a superb package, and one that remains very close to Gordon's heart. Later that year his biography PERILOUS JOURNEY written by Steve Pilkington was published by WYMER books. Steve had diligently and faithfully worked on it over at least a three year period. In January 2019 JHS produced a new guitar as part of the Giltrap range in memory of his late son Jamie who passed away in January 2018.The HEARTSONGS album and the biography were all part of a trilogy of items dedicated to his son’s memory. One of the great musical milestones in Gordon's life and career was to be invited in 2019 by one of the great icons of rock music Pete Townshend to play on a track for the new and eagerly awaited album by the legendary Who. The track SHE ROCKED MY WORLD featured acoustic guitars from Pete with Gordon adding his own signature riffs to Pete's unique playing. Pete described Gordon's contribution as "classic GG." It has been well documented that Pete was one of Gordon's early guitar influences. To be invited to work with the great man was for him an honour and a privilege. 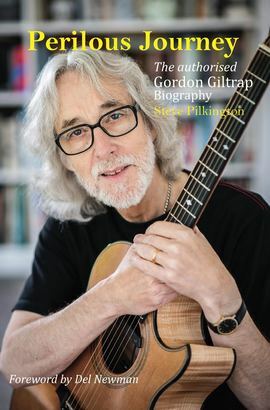 Gordon was appointed a Member of the Order of the British Empire (MBE) in the 2019 New Year Honours, "for services to music and to charity"
"Anyone who asks me knows that I think Gordon Giltrap is one of the best acoustic guitar players in the world. His concerts and playing are breathtaking. He’s also very witty, and I love the fact that he has not cut his hair!"